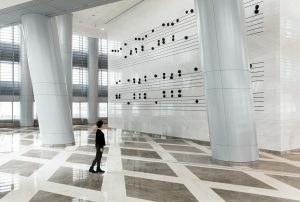 The installation entitled March is based on “Rondo alla Turca” (The Turkish March), which is the last movement of Mozart’s Piano Sonata No.11 in A Major, and was inspired by the rhythmical structure and sound of the Ottoman Janissary Bands. 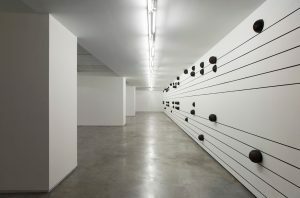 Following extensive research conducted in the military museums in Istanbul, the artist installed 94 bronze cannon balls – modeled after the cannon balls used by the Ottoman Army in the 19th century and produced in four different sizes – upon giant staffs drawn on the two walls of the gallery space. The way the cannonballs are arranged upon the two long and parallel running walls evoke a visual association with the notation of Mozart’s famous piece. 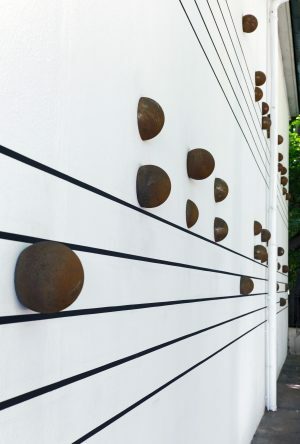 Even though they appear at first glance as the heads separated from the stems and flags of notes; upon a closer look they reveal themselves as the bronze cannonballs they indeed are, having been hurled at the wall at various degrees of force and speed. These balls embedded in the walls at differing depths evoke a feeling of being caught in crossfire. This serves to bring the military references — that are usually dismissed at the first hearing of this famous piece by Mozart and are often used as theme music in films, and advertising, especially to promote tourism, as well as in official state ceremonies in Turkey – to the forefront where they highlight the song’s wartime origins manifest in a kind of post-war setting. 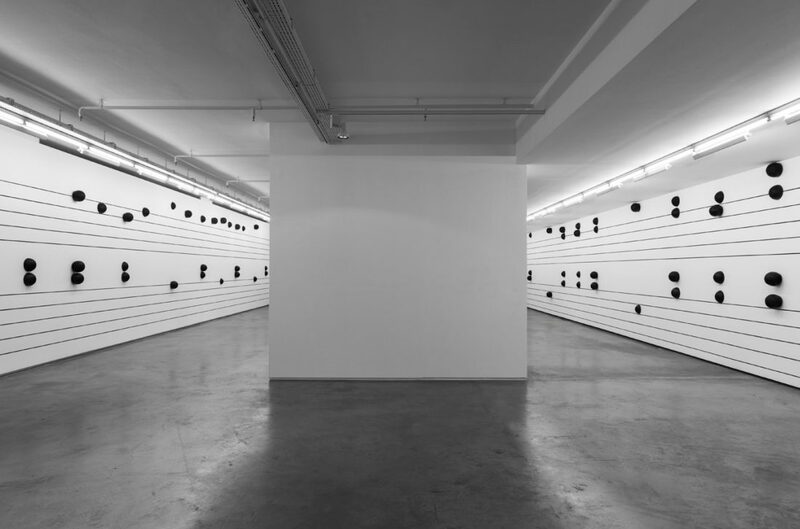 The title of the work refers both to the “military march” as a musical form and also to the military command: “March!”. For the back wall of Kunsthalle Basel, the artist has conceived the installation Marsch. 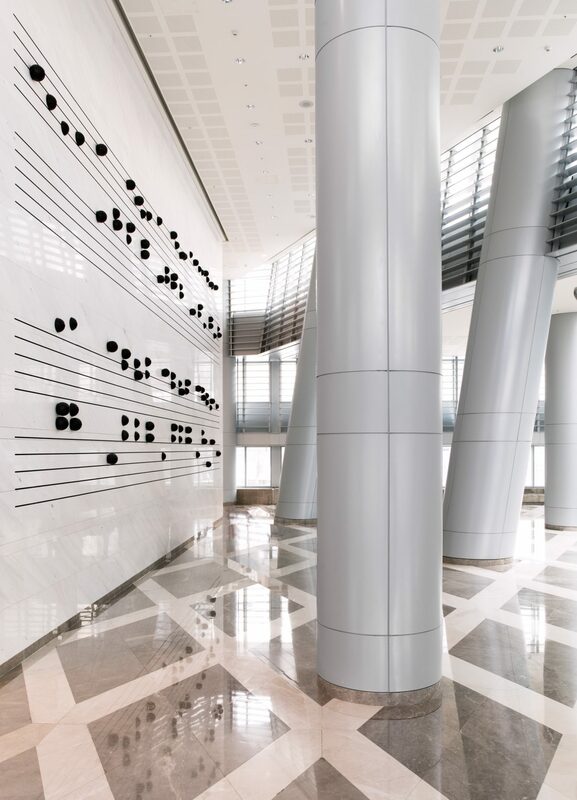 The wall serves as an outsize sheet of music that shows the opening bars of the Rondo alla Turca by Wolfgang Amadeus Mozart. 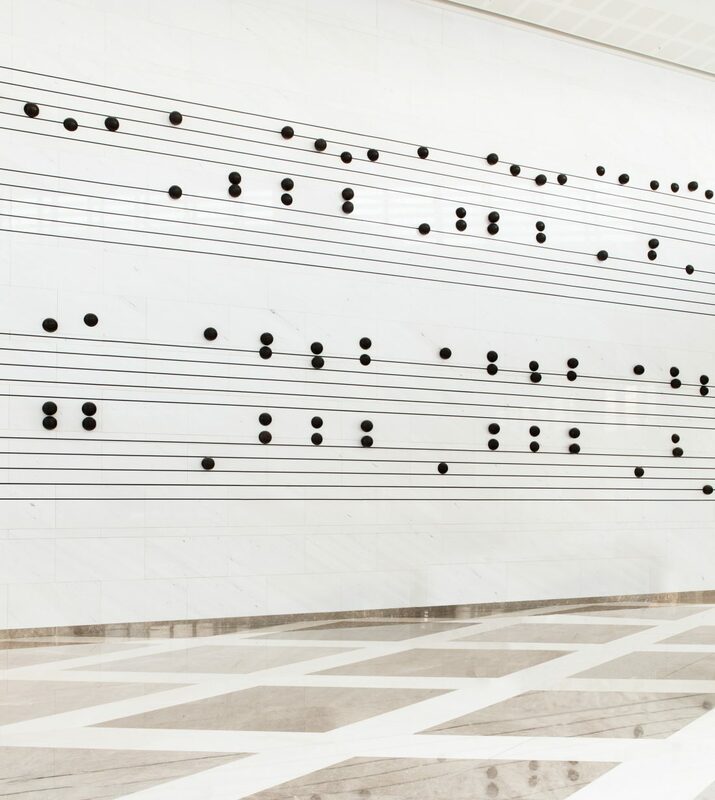 Also known as the Turkish March, the Rondo “in the Turkish style” was composed by Mozart in 1783/84 as the last movement of his Piano Sonata No. 11 in A major (KV 331). Its musical motifs imitate “Ottoman” percussion instruments as employed in Janissary music (a term denoting the music of the Ottoman military). 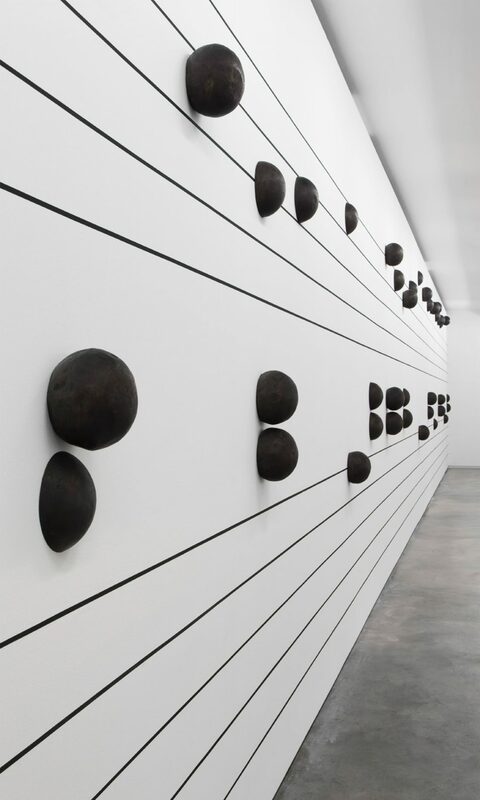 Nevin Aladağ represents the heads of the notes by means of cast-iron hemispheres that are based on an original cannonball preserved in the Historical Museum in Basel. Their volumes vary, giving the impression that they have been fired at the wall with varying degrees of force. Aladağ thereby calls to mind the true purpose of military music: its primary function is to dictate the choreography of troop movements, both on the battlefield and in peacetime parades. The time signature determines the marching speed and formation of the soldiers. The psychological role of military music is equally relevant: it is intended to reinforce esprit de corps and at the same time intimidate the opponent. The title Marsch (March) further reinforces the military reference implicit in the musical motif from Mozart’s Rondo. At the colloquial level, the title can be read as an imperative – “March!” – and hence, depending on interpretation, as a playful or stern command to start moving. 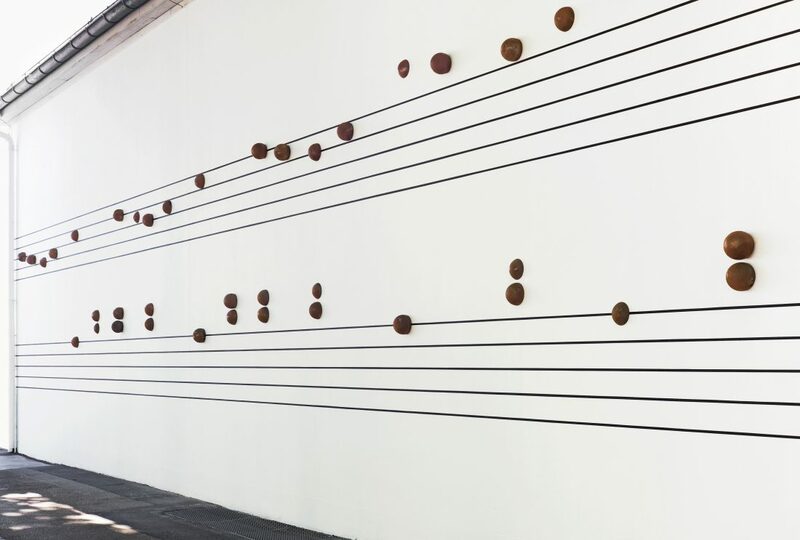 The viewer looking at the back wall is requested to walk the length of the notation, which marks a temporal and spatial progression. Thus the artist not only inscribes the music visually into the public space, but also gives it a material presence that is experienced through motion. The word “march”, in its meaning of an organized procession of people as a form of protest or for military purposes, is found in a very similar form in many European languages, pointing to a common origin: as well as Marsch (Ger. ), it can be recognized in marche (Fr. ), marcia (It. ), marcha (Sp.) and mars (Turk.). In etymological terms “march” goes back to the Frankish markon, “to mark” or “mark out” (with footprints). Here a military motif combines with a semantic one. 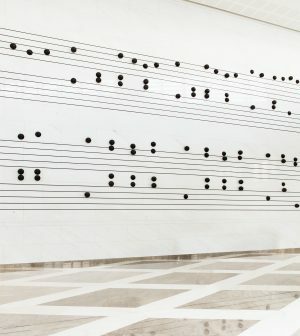 The notation of music captures, in abstract graphic signs, something that becomes what it is only through being performed. This performance is thereby largely regulated by additional signs in the notation: bar lines, the stems of the notes, accents, tempo… In Marsch, not even the fluctuating volumes of the hemispheres provide clues to the musical interpretation of the piece, since their variations bear no relation to the values of the notes. Aladağ frees Mozart’s Turkish March from its rigorous structure and renounces all indications as to how it should be played. The interpretation of this march thus navigates between strategy and chance – a situation that is comparable with the dynamics of a military conflict. 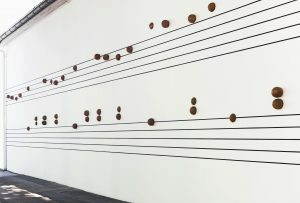 Aladağ's Marsch thus fuses making a mark, as originally signified by the word “march”, with the history of a musical motif that was extracted from its functional, military context and, overstepping cultural boundaries, was sublimated and depoliticized by the high art of another nation. The clear sculptural decisions made by Nevin Aladag render this complexity visible.